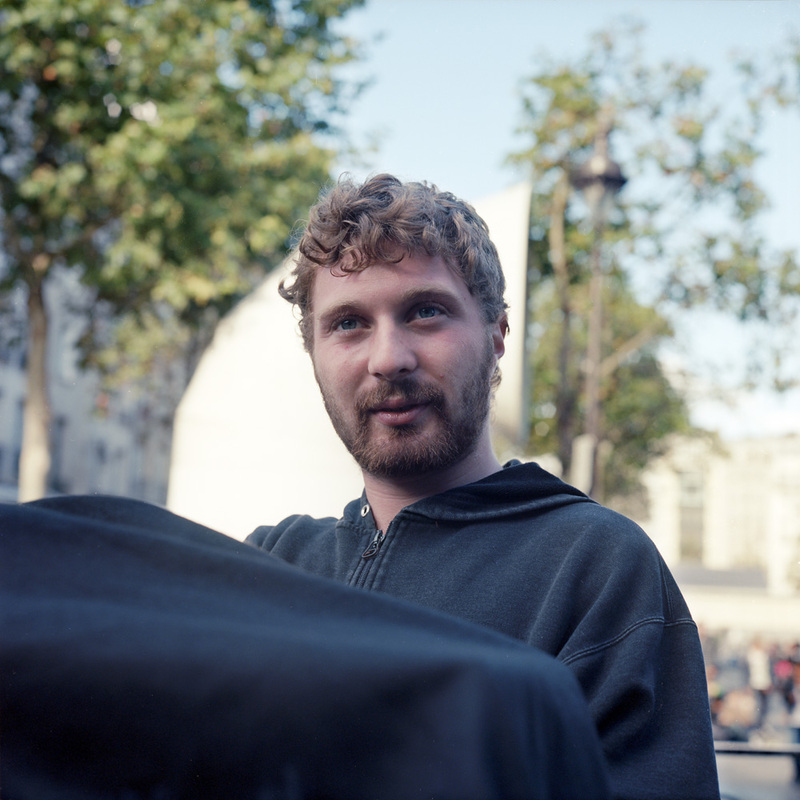 Meet Hans Zeeldieb, the street photographer working outside the Pompidou Centre. 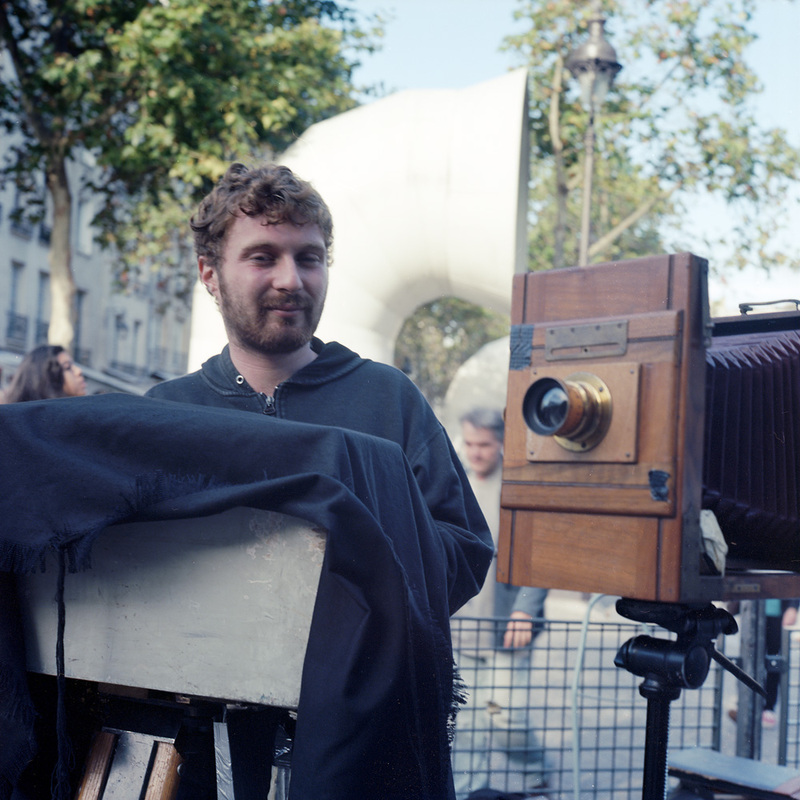 He was set up with his vintage 5×7, paper negatives, and portable darkbox doing portraits for 15 Euros a pop. He shot and developed them on the spot in 15 minutes. We struck up a friendly conversation when I saw his camera and he saw mine and talked a lot about photography. He sent me down the street a few blocks to the Centre Iris to go see an exhibit of wet plate collodion images by Jacques Cousin and several of his students, as well as some work by my friend Quinn Jacobson. Several years ago, I was involved in a gallery space in Hyattsville, Maryland called Art Reactor, where I curated a show of photographs made using the whole plate format*, and Quinn was one of the artists I selected. I think I made Hans a little nervous, as he overexposed the image of me. He did capture a good expression of me though, so I was happy to support a fellow working photographer. In the first photo, I caught Hans with his hands in the darkbox, processing a print. The way it works, he exposes a paper negative in the camera, then develops it in the box. After the negative is developed, he sandwiches it with another piece of paper, opens a window in the dark box to expose it again, and processes the second paper, which now has a positive image. There are several advantages to this process – by working with paper, the development and fixing is much faster than with film, and you can use the same chemistry for both your negative and your finished print. I’ve seen or read about other itinerant photographers using much the same technique around the world, from Madrid to Kabul. Here is a portrait of Hans outside the Pompidou Centre, just a close-up this time without the camera in the frame. He seems a little lost in thought – I think he was counting time for the print he was developing. * Whole Plate format is the original photographic format, defined today as 6 1/2 x 8 1/2 inches. It is not entirely certain how this size was chosen by Daguerre as the plate size he wanted to use, but reasonable speculation ties it to book printer’s printing plates. It has varied in its specification over time, but it settled on the 6 1/2 by 8 1/2 size by the late 19th century.